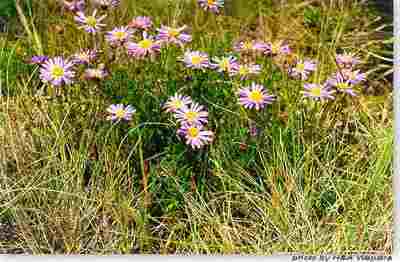 Flowerheads 1-1.8cm across with white, pink or various shades of blue daisy flowers. Small, perennial herb. Plants may be erect or prostrate, compact or straggling. Local in dry pastures in eastern and central parts of the state. B. rigidula prefers a sunny aspect and well-drained soil. It tolerates dry conditions but should not be allowed to dry out. Suitable below powerlines. Success from seed varied, fresh seed is vital. Propagate from stem cuttings which strike easily.